I enjoy working directly with a customer to create a custom design that reflects the wearer's personality, passions, and taste. Below you will find some important information for anyone interested in commissioning a unique fair trade piece. If you have any questions at all, please feel free to contact me. A great way to start exploring what you do and don't like is to take a look at my past work; the most comprehensive collection of these images is on my Flickr page. To be sure that you order the correct size, I suggest stopping in at a local jewelry shop to have your finger sized. Be aware that wider ring bands may tend to feel snugger than narrow bands, so if you’re going to order a wide band, ask your local jeweler to use a wide band sizer. Another thing to consider is the fact that comfort-fit bands can sometimes feel slightly more loose than straight-sided bands. There are also inexpensive ring sizer and mandrel sets available for purchase online. If you're trying to surprise someone with a ring and you need help guessing his/her ring size, check out these helpful tips. There are a huge variety of fair trade stones available for your custom piece. 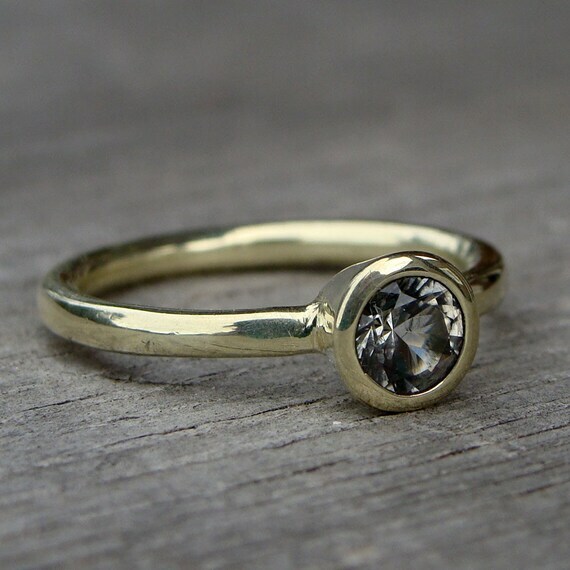 Whether you are looking for something traditional and diamond-like (I use moissanite), or something more colorful, chances are, there is a fair trade option that will meet your needs. I’ve even put together a guide to fair trade birthstones. I use recycled Harmony Metals in all of my work. Sterling silver is not generally recommended for wedding rings due to its softness and susceptibility to showing nicks, dings, and scratches with daily long-term wear. While I do still offer some rings in my Etsy shop that contain silver, I am no longer able to accommodate custom orders in silver. 14k yellow, white, rose, and green gold are also available for most designs. All will hold up well to a lifetime of wear. Gold does not oxidize (or tarnish), and it accepts a variety of finishes, including polished, brushed, etc. Please be aware that I do not rhodium plate my regular 14k white gold, so it will have a warmer tone than the rhodium plated versions you may have seen in mass marketed jewelry. 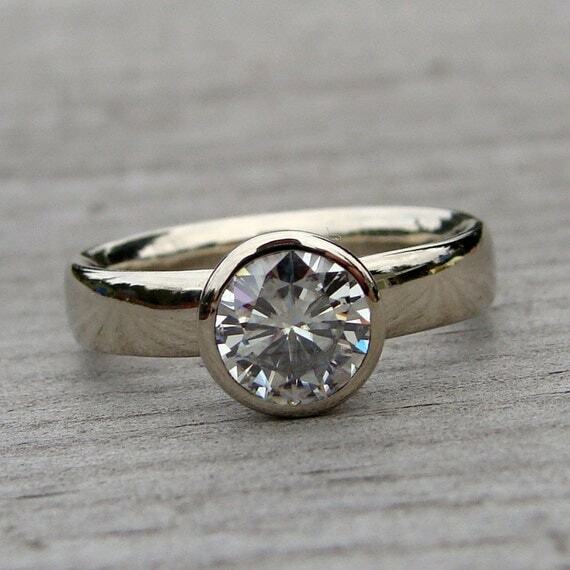 If you want to order something in white gold and like the bright-white look that rhodium plating offers, you should be able to have your ring plated locally after you receive it. This is a non-permanent treatment that will likely need to be re-applied every couple of years to maintain a bright white finish. Regular 14k white gold, left un-plated, can tend to acquire a yellower tone than some customers like with the passage of time. 14k Palladium White Gold contains the same gold content as conventional 14k white gold (58.5%), but adds a small amount of palladium to the mix, which gives it a slightly brighter color and better workability. The added palladium is supposed to give some measure of increased resistance to yellowing over time when compared with regular 14k white gold. This is also an excellent nickel-free alternative to traditional white gold, for those who have sensitivities to nickel. 18k Palladium White Gold is also nickel-free, and has the best grey/white (non-yellow) color of any of the white gold alloys I work with. Similar to its 14k counterpart described above, it has a brighter color and better workability compared with regular white gold. It contains the same gold content as conventional 18k white gold (75%). Of all of the white gold alloys I offer, it provides the best protection against yellowing. 950 Palladium is made up of 95% pure palladium, which is a noble metal in the platinum family. 950 Palladium is nickel-free and hypoallergenic, and it has a brighter (non-yellow) color (I would describe it as silvery-white when polished and more grey when given a matte finish) than any of the white gold alloys. It will not yellow over time, and for those who are very color-sensitive and don't want any yellow tone to their jewelry, it is my top recommendation. It is also a bit more affordable than either of the palladium white gold options. Metal hardness is indicated by a measure called Vickers Hardness (HV). The chart below shows the composition and HV ratings of each of the metals I currently work with. Many varieties of sizes, shapes, and finishes are available for the band of your ring, from the narrowest little 1.5mm band to a substantial 8mm band (and on up). I can do smooth bands, hammered bands, floral textured bands, square-edged bands, comfort-fit (rounded edge) bands, and more. Okay, I might have just made that word up. But you know what I mean, right? Some designs are easy to re-size, while others are impossible to re-size. If it's important to you that you are able to size your ring up or down, either right away because you're unsure of the size you need, or down the road to account for weight gain/loss, pregnancy, etc., please touch base with me about that before deciding on a design. 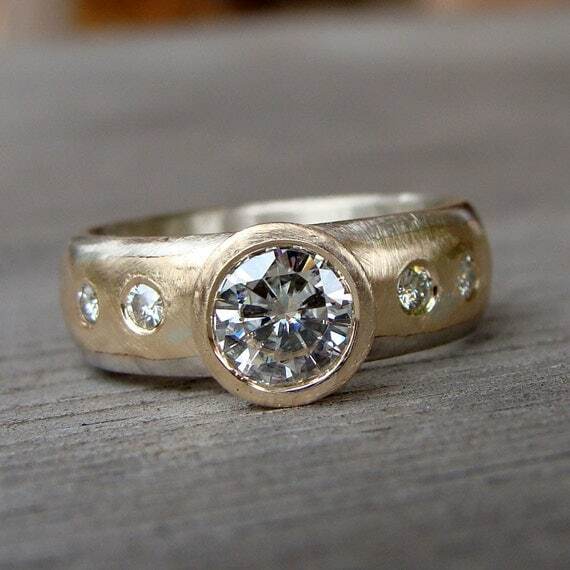 Bands that have one metal type layered on top of another metal are very difficult, if not impossible, to size up more than perhaps a half size, and can be sized down, but will likely have a visible solder seam in case of downsizing. If you're looking for a non-permanent down-size, this might be worth a try. If you're looking for a ring that will stand up to a lifetime of daily wear, you need to carefully consider your choice of metal (see above) and stone(s). My list of available stones includes information about the hardness/durability of each stone type. 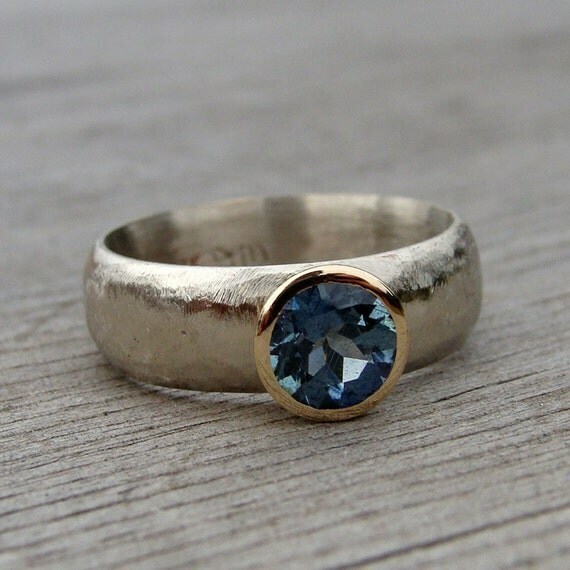 I often receive requests from customers to build a ring using a stone they provide. Unfortunately, at this time, I am unable to assume the liability associated with working with customers' stone. 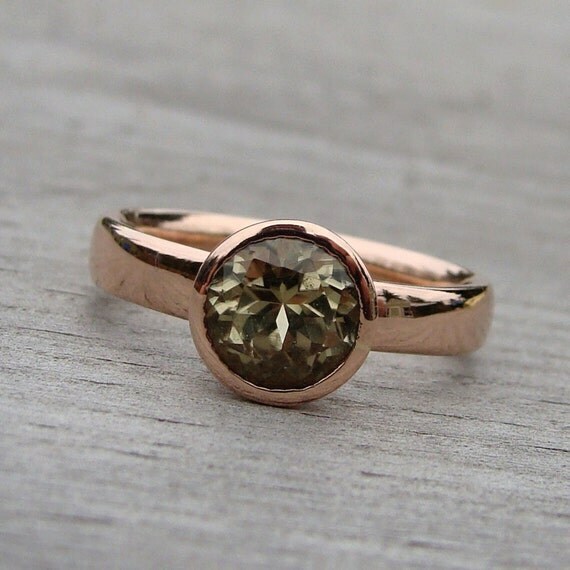 There is a very slight (but ever-present) risk of damaging a stone during the setting process, and it's not a risk that I am currently comfortable accepting. 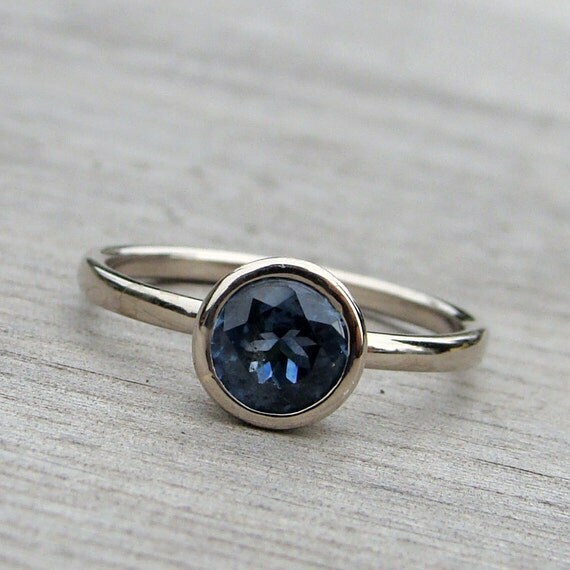 As an alternative, I am happy to discuss creating a ring without a stone, which you can then take to a local jewelry shop to have your stone set into - most jewelers will charge less than $100 for this service. My turnaround time on custom orders is usually around 3-4 weeks. Rush orders can sometimes be accommodated, subject to availability/timing of materials delivery, and are subject to a $50-$100 rush fee (the exact amount depends on the complexity of the design requested). I require a 50% deposit on custom work at the time the order is placed, with the remaining 50% payable upon completion of the piece (prior to shipment). I accept payments via Paypal, money order, or credit card (if you prefer to use your credit card outside of Paypal/Etsy, please contact me to schedule a phone call). 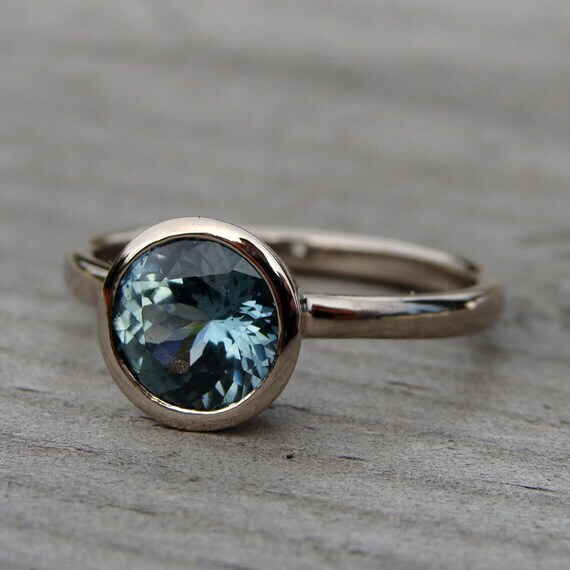 Ready-to-ship rings (which you can peruse in the sections of my Etsy shop labeled 'In-Stock Rings') are fully refundable (less shipping cost) if returned within two weeks of the purchase date in original condition. 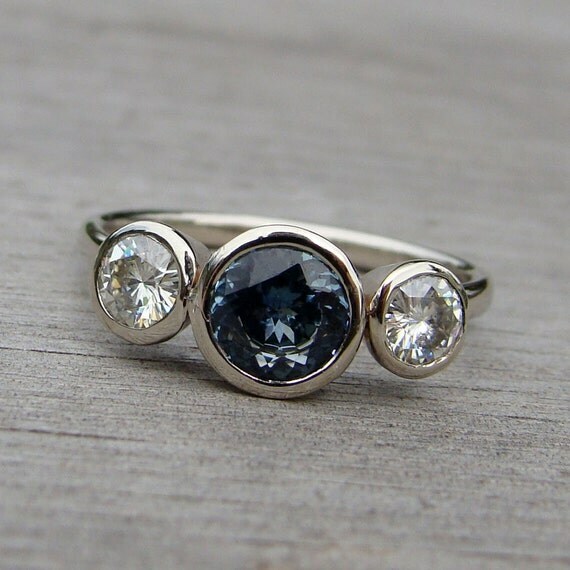 Due to the significant investment of time, materials, and creative energy that go into each custom piece, and the difficulty in re-selling a ring that has been made to custom specifications, I do charge a 25% re-stocking fee on these items, except in the rare case of product defect or artist error. I know that it can be tough ordering custom jewelry online, but there are a few things you can do to ensure a positive outcome. First, ask questions. If there's anything you aren't totally clear on during the process, please don't hesitate to ask me for clarification. 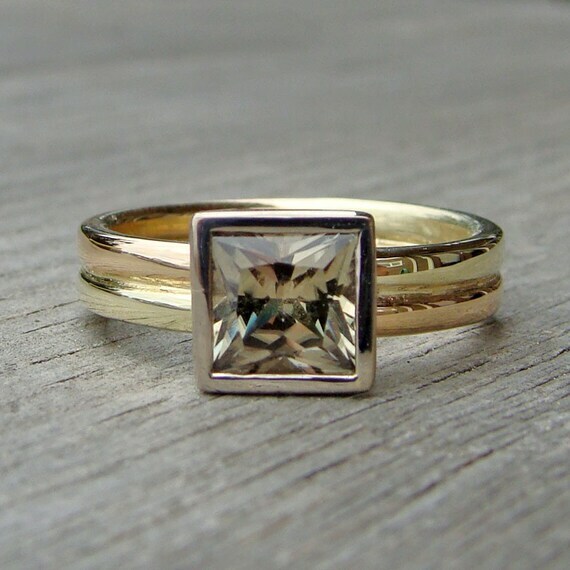 Second, seek out jewelry in person with similar dimensions to what you're ordering from me; if, for example, you're thinking about ordering a ring with a 5mm wide x 2mm thick band and a 7mm stone, stop in to a local jewelry shop and try something on that's about that same size. Also, depending on what you're interested in ordering, I may have a similar piece in stock that I can mail to you to look at in person for a couple of days (this requires an authorize-only transaction on your credit card, which reduces your available balance by the cost of the item, but does not actually charge you for the item). If you have questions or concerns about this policy, please feel free to bring it up for further discussion with me, either by phone or email. My goal is always to have happy customers, and I will do all that I can to ensure a positive outcome. If you have any questions or comments about the information I've provided here, or if you're ready to chat about a custom design, please get in touch.